There are many answers to that question and for each of us the answer will be different based upon our needs, but as Maira, my co-faciliator and an eating disorder therapist, shared it is because her body is so out of whack emotionally and chemically that some of the first steps for her is getting her body back into balance first. I want to share some ideas today around this question to provide anyone else who is feeling the same way with some alternatives. If you can stop that FIRST bite of a binge, you’ve conquered a lot. It’s giving in to the first bite where you give up and give in that starts the landslide from there. If you can keep the walls of the damn solid or distract yourself, if the case may be, long enough that the emotions and feelings that are behind what’s driving the binge you’ll allow the energy to move and pass and avoid the downfall of a binge and purge episode. How do I would know which bite is compulsive? It’s the one you identify that will send you into your usual binge frenzy. You know what I mean. Prevent the first compulsive bite and you prevent the binge. There’s another technique called HALT that reminds you to ask yourself if you are hungry, angry, lonely, or tired before reaching for food to comfort you. These emotions are strong binge triggers! As you might have guessed, eating for the sake of soothing while feeling them is not a good idea. Figure out what you are really feeling and distract yourself for a little while to address the problem instead is your alternative. Once you know why you want to eat and what is causing your emotions and the urge you can do something about it – and not give in to the urge. If you can map out ahead of time some of the things you will do instead of binging a trigger hits you and the urge to binge is strongest, you’re half way there. Find support from friends or loved ones who you can trust. If you trust them to be compassionate and when you’re having a triggering moment, ask them if you can reach out and have them “talk” you through it. In Overeaters Anonymous sponsors are there for just that purpose. You call your sponsor and confess when you’re having a triggering moment and they sort of talk you down off the cliff. If you’ve been binging and purging for awhile you can probably easily recognize your triggers and situations. They may change here or there, but there’s probably a pattern…a habit…that’s developed. Sit for a minute and look at your last few binges. When did they happen (what time of day)? What was going on at the time just before you started (environment/people/activities)? How were you feeling right before you started (bored, lonely, anxious, stressed, tired, sad)? Becoming self-aware of what’s going on that leads up to the binge can help you at least get to a point of awareness of what’s happening (or running you). Once you have awareness of the cycle and what your common cycles look like then you can begin choosing otherwise. Know that there’s a lot going on chemically and emotionally that you’ll want to prepare yourself for in advance if you want to kick this cycle or habit. There is research that indicates that bulimics may have a faulty satiation response center in the brain. Because the sensor that tells us we’re “full” or satiated may be out of whack we try to flood our brains with tryptophan by overeating on sugary foods. I know my binge foods were often cookies, cakes, ice cream and all things sugar or chocolate related. Triggering our body to produce it’s happiness drug – serotonin – will help you naturally feel better instead of turning to food to relieve those feelings of sadness, loneliness or anxiousness. One of my favorite recommendations for producing serotonin in women is talk therapy. I once learned that women produce serotonin when they talk to each other. It’s a wonderful release to share our daily lives with a best girlfriend and at the same time we’re naturally producing serotonin so we feel better. I found a couple of articles on how to naturally produce serotonin to share if you want to read more on this. Here’s one from BodyEcology.com and another from this nutritional supplement guy (Mark’s Daily Apple) and my favorite was about the four keys to increasing serotonin. One of my early teachers about women’s serotonin levels was Dr. John Gray who wrote Men Are From Mars, Women Are From Venus. He suggests eating foods that produce serotonin including his top 20: parsley, porcini mushrooms, seaweed (or kelp), dried dates, papaya, chanterelle mushrooms, yucca, tapioca, beer, onions, portobella mushrooms, mushrooms, pecans, mustard greens, watermelon, celery, yellow mustard seed, rutabaga, spirulina, seaweed. I’ll let you continue your research in this direction, but recognize that it’s part chemicals in the body that may be triggering your binging and purging. I also share bulimia help ideas with my newsletter subscribers including my recommended first 10 steps to eating disorder recovery. If you’d like to receive my 10 steps to beat bulimia and my free ebook, sign up today. If you have any experience with how to stop a binge, please share your thoughts and ideas below. I welcome feedback! p.s. I had such an incredible response to this post, I wrote a book called How to Stop a Binge that’s now available for you to download for jus $2.99. Get your copy today! Great info you are sharing. 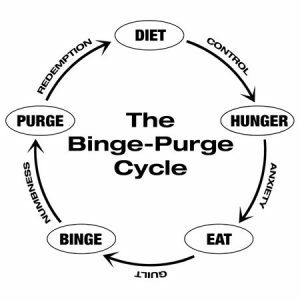 A lot of bulimics can surely relate to how it is difficult to stop this kind of urge to eat and eat but by learning how to take control of this urge they can start to recover and regain control of themselves. There are also treatments available now to help bulimics and even anorexics to completely recovery from these life-threatening conditions. You can learn about such treatment from Montrose Manor – a primary care facility for the treatment of eating disorders. Contact them now to get help. Thanks Edward for your recommendation. Keep up the great work! You too Polly Keep it up! 🙂 Really like the info you are sharing.